Two great businesses, one meaningful motto. At Sunshine our motto truly says it all. 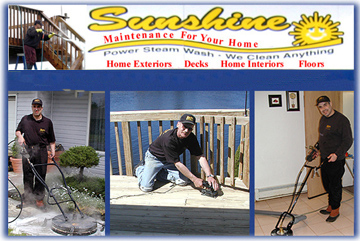 For your home or Auto, Sunshine has a choice to suit any need and satisfy any budget. We pride ourselves on the thoroughness of our work for sure, but the key to our success is the VALUE that we deliver. We invite you to spend some time examining some of our work and reviewing the programs from which you can choose. Then call us, schedule your appointment, you'll be glad that you did.